When I was in college, I worked one of the best jobs for college students I could possibly ask for. I was a team lead at my school’s indoor recreation center. I loved my job. Seriously, who wouldn’t love getting paid to do homework and play pool? And as a team lead, I took my job pretty seriously (nerd alert ?). It was my job to train the new employees, manage our events, and do my damndest to make sure everyone had a good time. Unfortunately, not everyone I worked with shared my same level of commitment to the job. Every day students would call in or forget their shifts, and I would be stuck cleaning up the resulting mess. At the time it was super frustrating, but in hindsight, it’s a little easier to empathize. Working through college can help offset some big expenses, but between classes, volunteer work, and enjoying some of the best years of your life, it can be difficult to fit into a rigid work schedule. 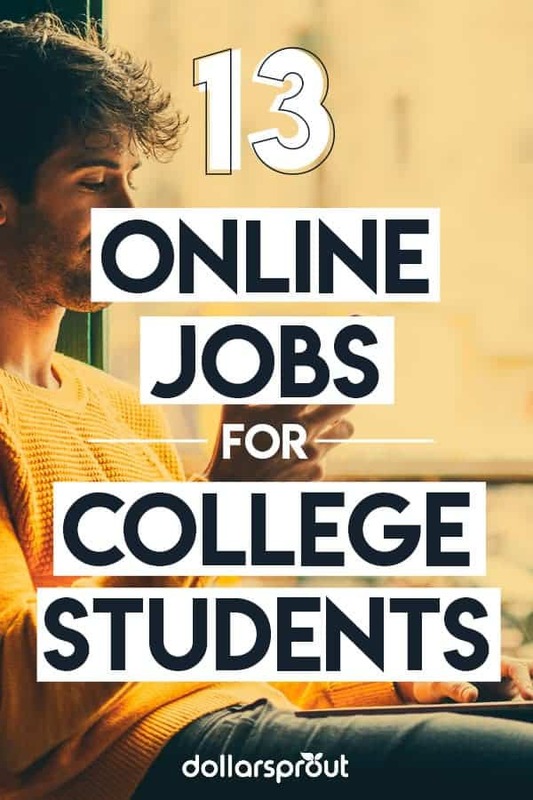 If you’re in college and want to work but have trouble finding the time, these online jobs for students to earn money can give you the flexibility you’re looking for. Not to mention working online often pays way better than your regular campus positions. Double win. Most of us spend hours a week on social media anyway. Why not get paid for it? Every business uses social media, but managing it in-house is more expensive (employee taxes) and employees’ time is better spent elsewhere. That’s where independently contracted social media managers come in. Social media managers help build brand awareness by curating content, building relationships with potential customers, and driving new leads. Your job is to be the online voice of the company. Get started as a social media manager by approaching local businesses and telling them about your services. Start by reaching out to businesses you already frequent — yoga studios, coffee shops, boutiques, restaurants, etc. Focus on whatever social media platforms you’re most comfortable with, and talk about how you can use it to grow their business and reach new customers. The key to making money as a blogger is to write content that provides value to your readers. No one wants to read an article titled “My Family Vacation to Hawaii,” (except maybe your mom and aunt Jody). On the other hand, a piece on “7 Things You Need to Know Before Vacationing in Hawaii” is both intriguing and helpful. Before you start your blog, choose a topic you enjoy writing about, and make it specific. As they say in marketing, if you speak to everyone, you’ll speak to no one. Once you have your topic, write down at least 20 blog post ideas, then get to crackin’ on your first five posts. This is a good test of whether or not you actually enjoy writing on your chosen subject (or even at all). Once you’re ready to start your blog, the next step is to choose a host for your website. HostGator is a popular option and the one we recommend for beginner bloggers. It’s not free — plans start at $2.75 per month — but it’s an essential first step. See our step-by-step guide to starting a profitable blog to kick things off on the right foot. Don’t sweat your credentials here — if you have good grammatical skills and a desire to write, you can make it as a freelance writer. Just ask Holly Johnson. She went from working in a mortuary to making over $200,000 per year as a freelance writer. You read that right — $200,000. Freelance writing is a flexible and lucrative way to make money in college. And think how cool it would be to add to your resume “Published in the New York Times” or some other big media outlet. Having an online presence in the form of your own blog can help you land high-paying clients faster and serve as a portfolio for your work. Otherwise, you can get started as a freelance writer by picking up clients on Upwork. Once you’ve got some work to show and testimonials to back you up, start pitching to jobs on Problogger and Freelance Writing Jobs. Virtual assistant services range from data entry and customer service to copywriting and email marketing. The amount you can charge as a virtual assistant depends on your skillset and experience. Specialized skills like copywriting or email marketing are premium services that pay premium rates. Businesses hire virtual assistants to outsource tasks that don’t need to be done in-house. For example, a cafe makes food, keeps the dining and kitchen areas clean, and serves customers. They don’t specialize in social media management or content marketing. By hiring a virtual assistant, they can avoid paying employee taxes (since VAs aren’t employees of the businesses they work for) and have someone experienced managing their digital marketing efforts. Start working as a virtual assistant by making a list of services you can offer. Then create profiles on Zirtual and Virtual Assistant Networking to start booking your first clients. For more information, see our guide on the exact steps to become a virtual assistant. You don’t have to be a graphic design major to make money online as a graphic designer. All you need are the right tools and an eye for detail. Small businesses need appealing graphics for everything — business cards, logos, social media images, etc. If you’re like me and enjoy judging your Facebook friends on their poor grammar and leaving snarky comments (“you’re” not “your” — it’s not that hard!) then you were made to be a proofreader. Yes, it’s one of the best online jobs for college students since you’re using your proofreading skills all the time anyway. Editing and proofreading are two very different things. Editing involves restructuring, deleting, and adding content, whereas proofreading is checking for spelling, grammatical, and punctuation errors. It’s the final stage right before a piece of content is published. Check out the free seven-day course over on Proofread Anywhere. The creator of the course, Caitlin Pyle, started her own proofreading business and used it to make a living online to fund her travels. Begin booking proofreading jobs by setting up a freelancer profile online. 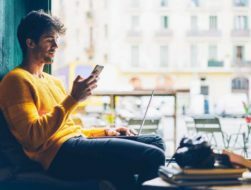 There’s no shortage of opportunities on Upwork and Freelancer. My freshman year of college I went to my first career fair with a resume that was three pages long and said basically nothing. Yikes. Online jobs for college students don’t typically expect tons of background and experience on our resumes, but that doesn’t mean we shouldn’t try to make our resume stand out. So I took a couple free workshops through the division of student affairs and learned how to create a killer resume that landed me an internship with a prestigious company (in a position that normally goes to juniors but I got as a sophomore. Holla??). After that, all my friends asked me to help pump up their resumes, too. I didn’t realize it at the time, but I could have gone beyond my friend group and turned my little workshop into a nice side hustle. Now I’m here to warn you so you don’t make my same mistake. Take advantage of free resources to help build your skills, like school workshops or this resume writing class on SkillShare. Again, the easiest way to start offering your resume writing services is through freelance sites like Upwork or Freelancer. Even better? Ask around in your circle and see who’s looking for a job or summer internship. It may not be online, but it’s faster than freelancing with less competition. Teaching online is how I was originally able to quit my full-time job and work online jobs from home instead. The best part about tutoring is that you’re reinforcing what you’ve already learned, so if you tutor subjects in your major, it’s like getting paid to study. But if you need a breather from school, you don’t have to stick to academic subjects. You can also tutor in your other areas of expertise, like an instrument or sport. I dated a guy in college who ran a side business as a web developer. He was an economics major, but that didn’t stop him from learning to code which led to many online jobs for college students for him to work on. After I left my job to teach online, I decided to add web development to my repertoire of freelance services, so I took The Complete Web Developer Course (currently $10.99) on Udemy. This course taught me everything I needed to know to start booking clients and paid for itself in just a week. Of course, one class didn’t make me a professional coder, but it gave me a good foundation and the confidence to take on my first clients. For new web developers, it’s best to start with smaller projects. Most of the work I did was editing existing websites rather than building new ones. With your new coding skills in your back pocket, you can begin by bidding on projects on PeoplePerHour, Upwork, and Freelancer. Good web developers are always in high demand. Surveys aren’t the most fun gig, but they are one of the easiest. Survey sites collect consumer data that companies use to improve their products. The resulting increase in their bottom line is why these companies are so eager to pay everyday people for their opinions. In just a few minutes a day, you can make a nice side income with paid online surveys. Our of our favorites is Swagbucks because of the many different ways to earn (watching videos, taking surveys, playing games, browsing the web, and more). To get started as a survey taker, create an account for each site you plan to use. Since you won’t be eligible for every survey, you’ll earn more by signing up with several (Survey Junkie is another favorite). For more survey companies like Swagbucks, check out the best paid survey sites where our readers earn the most. We love Google, but technology isn’t always perfect. That’s why search engines rely on real people to provide feedback on the relevance and usefulness of their results. These types of online jobs for college students are usually 10 to 30 hours per week and can easily work around a busy college schedule. Five dollars doesn’t sound like much, but for tasks that take just a few minutes of your time, it adds up fast. And it only goes up from there. Projects on Fiverr range from $5 to $995, and you can offer three versions of your services at three different price points. Many Fiverr sellers have turned it into their full-time gig, while others use it to make money on the side. Services on Fiverr include everything you can imagine. There are the usual services like writing, web development, and graphic design. But if none of those tickle your fancy, try something a little unorthodox like prank calls or celebrity impressions. Data entry online jobs are relatively stress-free and don’t require any specialized skill, which makes them great online jobs for college students who don’t want a serious commitment. There’s no shortage of online jobs for college students with no experience. Working online is the best setup for most college students and it doesn’t always require any experience to succeed. The gigs are flexible, usually pay better than campus and other brick-and-mortar jobs, and you don’t have to take off for holiday breaks. If you find something you’re really passionate about, you could even turn your college side gig into your full-time career. Have you worked one of these or other online jobs in college? How did it go? Hello, my name is Dawn Yablonsky. I just recently graduated from college. I am looking for work that would meet my needs of working from home. But all of the sites that I have checked out did not seem to be legitimate. Is there anyway that you can help me? Hello Megan, my name is Mercedes Pacheco. I am currently a senior at the University of New Mexico. I will be graduating this May with a bachelor’s degree in Psychology, with a minor in Communication and Journalism. Being that last semester was my final seamster being a student athlete, my schedule has opened up a lot. I am looking for work now and I would love to be apart of your team. Learning money and behavior patterns surrounding money is imperative to someone coming newly into the “adult-world”. It would be an honor to get in touch with you. You have some money to invest, but not a whole lot of time. What are the best short-term investments to maximize your returns? These short-term investments can help you make the most money with the time you have. How would you like to get paid to shop with the best mystery shopping companies? That’s exactly what thousands of people just like you and me are doing to earn hundreds, even thousands of dollars each month. Here’s how.